Last year’s challenge is a gift that keeps on giving. As I made my way through the year, drawer by drawer, I chose to present the best that drawer had to offer, create a boffo necklace and blog it. The gift is that many drawers offered several choices of fabulous beads which I put aside for future consideration. Well, the future is now. I have several trays full of plastic bags each containing a necklace wanting to be designed. The first to jump out is New Jade with a magnificent carved jade centerpiece. I’ve collected new jade beads for years, liking their milky green color with their cloudy opacity. Guess what? New jade is the trade name for semi-translucent serpentine! It’s OK that it is not jade; I have always considered serpentine as a cousin of jade. The real story here is the centerpiece: it is real jade, variegated from white to mountain green, carved with the usual flourishes of talented carvers plus the open work circle which is not often seen—perhaps due to the difficulties posed by carving one of the hardest stones. 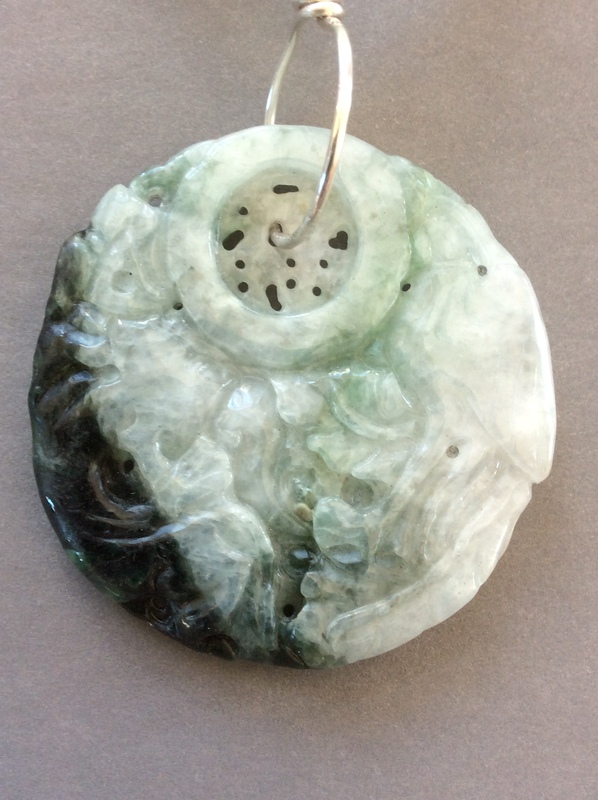 Many jade centerpieces in my stash are round and I now know why: they were girdle ornaments in ancient China. Read girdle as belt, perhaps similar to a Japanese obi. In the Zhou dynasty (1050—256 AD), seven carved jade pieces hung down from the belts of men and women. The wearers enjoyed the tinkling of the ornaments as they walked, reminding them of music, claiming it put them in a joyful disposition. I enjoyed reading that in royal Zhou courts, only the king could wear white jade; princes wore green the color of mountains; prefects wore a water blue stone; and mere officials were assigned to prehnite which is pale green in color. Men and women of all classes wore them, choosing emblems of their life’s work (which type of stone was not noted). 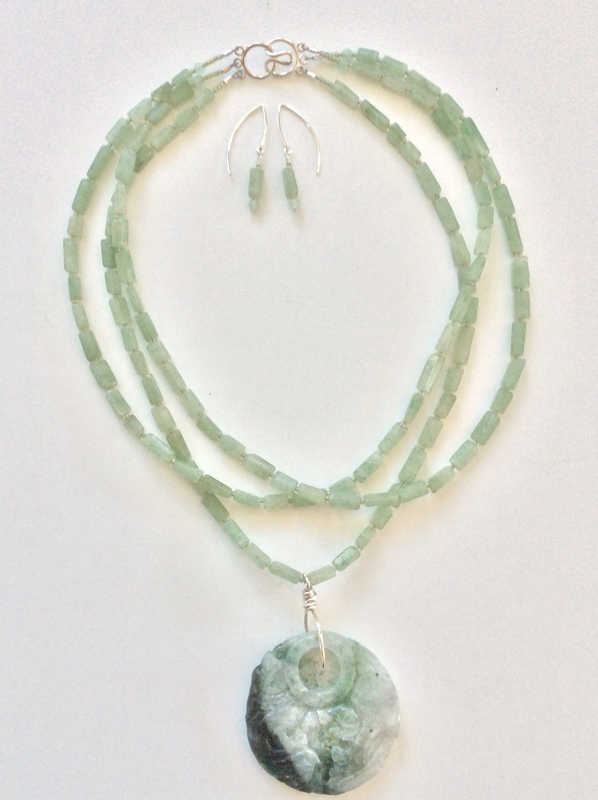 The necklace has three strands of hand cut new jade with earrings to match. Both are finished in sterling silver. It is 18.5” long. The centerpiece is 2” diameter and .25” thick. It is not heavy, weighing three ounces. $99 the set. I do not mean to imply the centerpiece is ancient. To the best of my knowledge, it is contemporary. Most of my research came from a book I purchased in Hong Kong in 1994. Originally published in 1912, republished in 1974, my unabridged edition of Jade: Its History and Symbolism in China by Berthold Laufer was republished in 1989.